Proper identification of a Japanese maple leaf can be quiet difficult due to its similarities with other forms of maple trees and a few other plants. The following article will explain some of the key characteristics of a Japanese maple leaf and some of the concerns that may lead to a Japanese maple leaf growing unhealthy or misshapen. Commonly a Japanese maple leaf varies in coloration between green red or a purplish hue ranging to even a yellow or orange depending on the season. These colors can vary with the season with the reds orange and yellow colors generally appearing in the fall. The leaves themselves vary by species, with some appearing quite thin and intricate, these leaves form an almost lacy pattern and give the tree itself a real character. There are solid green leaves in some species which look very similar to a traditional maple tree save for the very precise tips at the end of each of the 5 main lobes the leaf has. There are also variations on the Japanese maple leaf that have very thin lobes which look similar to a tropical plant and extend each outward from the stem onto a very finely tipped point. In many cases classifying these leaves can be quiet difficult given the variety of species. The best way to classify a potential Japanese maple leaf is to look at the list of species or ask an expert as there are so very many different leaf variations among the different species. These trees can be found in north America though they are not a native species to the area. As long as the tree is not exposed to cold winds it will flourish and if wrapped in burlap during the cold the leaves will remain full and the tree can remain healthy. If a Japanese maple is exposed to extreme cold it can potentially die off. It is possible to find a Japanese maple leaf in north America but keep in mind the tree was most definitely planted by someone and did not grow there naturally. If you see dead tan areas on a Japanese maple leaf, it is quite possible that the tree or leaves are being fed off of by aphids. Aphids can infest the Japanese maple and in some cases cause the leaves to shed prematurely. 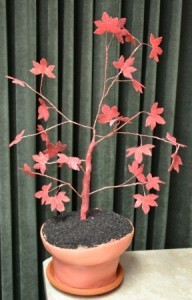 Japanese maple trees can also become scorched in direct sunlight. It is always better placed in a bit of shade as these trees can dry out quite quickly. Keeping a Japanese maple protected from the elements is crucial to it’s survival. As you can see there are a large number of different variations on Japanese maple leaves. Keeping track of these is best done by using reference material to educate yourself on the exact formation and variations of the different species and their leaves. Keeping in mind where Japanese maples can grow can help you to identify the leaves as well, and by looking at the leaves for any signs of unhealthiness in the leaves it is possible to ensure that a Japanese maple not only survives but thrives in a garden. I grew Japanese maples from seeds following your instructions this spring. The leaves on the plants don’t look anything like the trees they came from (no feathering). Does it take a year or so to feather or do I have some other plants growing? I took great care not to crosscontaminate. Every year thinner coverage and now can see through branches. Dead branches snap easy and dry with no color . large branches come down randomly . 45 year old multi tree growth . 3 heat waves this year over 95 and rain down 5″ to date. Little brown holes on leaves and browned tips. Could be the tree just got too dry at some point over the summer. Trim away dead branches, water if needed and give the tree some time. Might look great next spring.